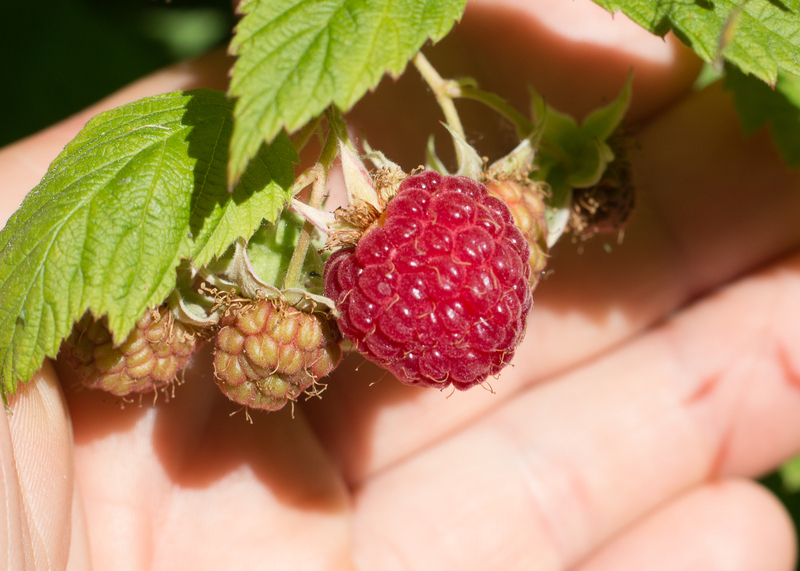 Native to North America, red raspberries grow from perennial roots. The tall, thorny canes are brownish red and woody, reach full size the first year, produce heavily the second year, then die and are replaced by new canes. Leaves consist of 3 to 5 irregularly toothed leaflets, whitish and hairy underneath. Flowers are white, with 5 petals, and appear in clusters. Fruits are red when ripe, and are made up of numerous tiny druplets. Summer bearing varieties only produce fruit once per cane, while everbearing canes fruit a little the first year on the upper third of the cane and then the second year on the lower 2/3 of the cane. Wild varieties, shorter than cultivated varieties, can be found in thickets and at forest edges, often near water or roadsides in full sun. The best berries come from plants that receive winter chill and a slow warm up period in the spring. Good drainage is a must. During flowering and fruiting, the plants are heavy feeders and need consistent moisture. Collect raspberries in the late summer and early fall.